This was the first espresso created by Barista. Time has made this typically Italian blend a classic of our product offering. 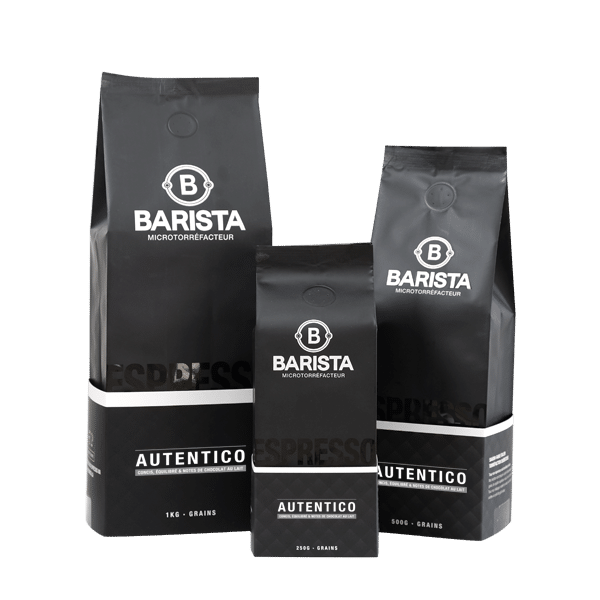 Developed in 2004, Autentico is an honest product that lets you discover traditional espresso at its very finest. The blend hails from Peru. Its very mild acidity is typical of the South American coffee-growing region. With bold notes of milk chocolate and nuts, Autentico is the answer to commercial Italian imports. As is the case with all Italian espressos, it presents just a hint of acidity – almost to the point of sweetness. Its light roasting aroma (cooking) dissipates just about instantly once on the palate, making it the ideal blend for your espressos and macchiatos served short or long. If you have only recently started drinking espresso, this sharp, balanced Peruvian is a wonderful introduction to the delicious world of real coffee. It boasts a classic, accessible Italian flavour you can find in any bar in Rome or Florence. That’s because our master roaster only crafts products that are authentic.